I take a ridiculous amount of pride in being a good professional reference. After all, who am I to stand in the way of a person looking to improve their work situation or to make a better life for themselves? Here’s how I ensure I am the perfect professional reference. If I’m your reference, and you don’t get the job, it ain’t on me, buddy! 1) I make sure I pick up the phone when they call. Getting embroiled in a game of phone tag only hurts the prospect’s chances, especially if the company is in a rush to fill the slot. Most people won’t roll the dice on picking up a call from an unidentified number. But if your colleague has tipped you off that a call might be coming in, take a chance. In the long run, it will save you time. 2) I make sure I take the call in a quiet location. If I am forced to whisper at work or am shouting over other folks in a public setting, the conversation will suffer. Since we are dealing with another person’s livelihood, it’s critical to set aside a few minutes to give the call your full attention. 3) I define roles from the start. I make it very clear what my role is with the organization so that the interviewer understands the context in which I work with the employee they’re checking on. I paint an honest picture of the frequency in which we interact and the types of projects we work together on. 4) Company unmasked. I will not speak poorly of the employer that the candidate might be leaving, after all, they are the one still paying my bills. But I will intimate what some of the inherent problems are with the company — perhaps the circumstances of why the person is looking for a new position. There are things about the company that I know the job candidate can’t mention – so I try to give them a small assist and do a touch of the dirty work for them. 5) Keep the door open. This might sound a little selfish, but as a reference, you have now gained contact with YOUR next potential employer. Communicate well and always end the conversation by saying you’re willing to speak again. Perhaps even follow-up with a LinkedIn request. 6) Karma. I’m tired of people telling me they didn’t get a job because of something they did in a past life. Karma is dictated by everything we say, everything we do and everything we think – in THIS life. Hey, at the very least, you’ll get the job in your next go-around. Be a Buddhist at work and give other people the type of reference that you hope for yourself. 8) It’s a commitment. When you agree to be a reference you might get one call or 10. If you commit to being an ambassador of good will, be prepared to help the person find a new job any way possible. The call might come in a week from now or even in a year or two. 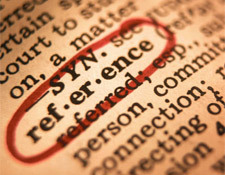 Good references are hard to find, so when you say ‘yes’ either set conditions or accept the job on a long-term basis. When a person lands the job, they’ve done so because of their work experience and other factors. Your kind words, while important, are usually gravy. Aside from a hearty ‘thank you,’ you shouldn’t expect anything for your job as a reference. The only glory you’ll get is feeling good about yourself — and that should be good enough.